In small rondeau bring the nage to a simmer. Season the Nage with Salt to achieve the desired flavor. Remove the salmon when the desired doneness is achieved. Add all the baby vegetables into a medium sauté pan with a small amount of the nage, as well as the butter. Bring the mixture to a boil, reducing to form a glaze. Arrange the Salmon on in the center of warm entrée sized bowls. 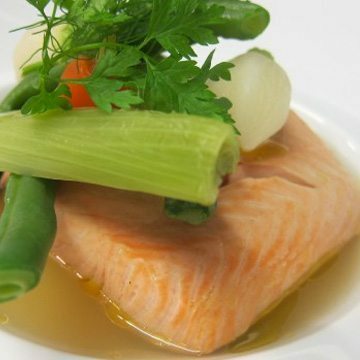 Place the Baby vegetables decoratively atop the salmon fillet. Garnish the dish by placing the fennel fronds and chervil sprigs atop the baby vegetables, drizzle the remaining extra virgin olive oil into the nage on each bowl.